For the Norwegian newspaper, see Dagens Nyheter (Norwegian newspaper). Dagens Nyheter (Swedish pronunciation: [ˈdɑːɡɛns ²nyːˌheːtɛr], lit. "today's news"), abbreviated DN, is a daily newspaper in Sweden. It is published in Stockholm and aspires to full national and international coverage. Dagens Nyheter was founded by Rudolf Wall in December 1864. The first issue was published on 23 December 1864. During its initial period the paper was published in the morning. In 1874 the paper became a joint stock company. Its circulation in 1880 was 15,000 copies. In the 1890s, Wall left Dagens Nyheter and soon after, the paper became the organ of the Liberal Party. From 1946 to 1959 Herbert Tingsten was the executive editor. The newspaper is owned by the Bonnier Group. Dagens Nyheter operates from the so-called "DN-skrapan" (the DN skyscraper or Dagens Nyheter Tower) in Sweden. This was completed in 1964 and was designed by the architect Paul Hedqvist. It is 84 metres (276 feet) tall and has 27 floors, none of which are underground. In 1996, the entire enterprise moved to its current location on Gjörwellsgatan, which is adjacent to the old tower. The newspaper Expressen, also owned by the Bonnier Group, is located in this building as well. Opinion leaders often choose Dagens Nyheter as the venue for publishing major opinion editorials. The stated position of the editorial page is "independently liberal". However, it left its formal alliance with the liberal establishment in the country in 1972. In the 1960s the circulation of Dagens Nyheter was much higher than that of other Swedish dailies. The paper has the largest circulation among the Swedish morning newspapers followed by Göteborgs-Posten and Svenska Dagbladet, and is the only morning newspaper that is distributed to subscribers across the whole country. In 2001 its circulation was 361,000 copies. The 2004 circulation of the paper was 363,000 copies. The circulation of the paper was 363,100 copies in weekdays in 2005 and had dropped to 292,300 copies in 2010. In 2013, the print edition of Dagens Nyheter had a circulation of 282,800 copies, reaching an approximate 758,000 persons every day. The web edition, dn.se, had on average roughly 1.5 million unique visitors per week during 2013. 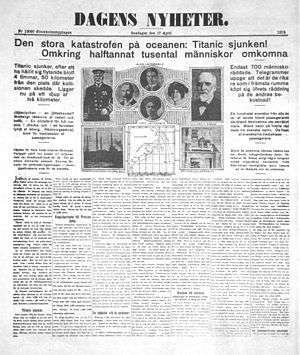 Dagens Nyheter on 17 April 1912: "The great catastrophe of the Ocean: The Titanic sunk". 1 2 "Dagens Nyheter". Encyclopedia Britannica. Retrieved 18 November 2014. 1 2 Oskar Bandle; Kurt Braunmuller; Ernst-Hakon Jahr; Allan Karker; Hans-Peter Naumann; Ulf Teleman (2005). The Nordic Languages 2: An International Handbook of the History of the North Germanic Languages. Walter de Gruyter. p. 1487. ISBN 978-3-11-017149-5. Retrieved 24 November 2014. ↑ Christoffer Rydland (2013). "Aspects of Cooperation and Corporate Governance in the Swedish Regional Newspaper Industry" (PhD Thesis). Stockholm School of Economics. Retrieved 16 January 2015. 1 2 3 Stig Hadenius; Lennart Weibull (1999). "The Swedish Newspaper System in the Late 1990s. Tradition and Transition" (PDF). Nordicom Review. 1 (1). Retrieved 31 December 2014. ↑ Karl Erik Gustafsson; Per Rydén (2010). A History of the Press in Sweden (PDF). Gothenburg: Nordicom. ISBN 978-91-86523-08-4. Retrieved 13 February 2015. ↑ Johanna Rainio-Niemi (5 February 2014). The Ideological Cold War: The Politics of Neutrality in Austria and Finland. Taylor & Francis. p. 184. ISBN 978-1-135-04240-0. Retrieved 1 January 2015. 1 2 3 "Swedish mass media" (PDF). Swedish Institute. 2006. Archived from the original (PDF) on 25 September 2013. Retrieved 18 November 2014. ↑ Panagiota Koulouvari (2004). "Family-Owned Media Companies in the Nordic Countries: Research Issues and Challenges" (Working Paper Series No:2). Jönköping International Business School. Retrieved 8 January 2015. ↑ Robert G. Picard. "Media Ownership and Concentration in the Nordic Nations" (PDF). Le Centre d'études sur les médias. Retrieved 13 August 2014. ↑ Stig A. Nohrstedt et. al. (2000). "From the Persian Gulf to Kosovo — War Journalism and Propaganda" (PDF). European Journal of Communication. 15 (3). Retrieved 8 January 2015. ↑ Sigurd Allern; Mark Blach-Ørsten (2011). "The News Media as a Political Institution". Journalism Studies. 12 (1). doi:10.1080/1461670X.2010.511958. Retrieved 25 January 2015. ↑ Adam Smith (15 November 2002). "Europe's Top Papers". campaign. Retrieved 7 February 2015. ↑ "The press in Sweden". BBC News. 2004. Retrieved 18 November 2014. 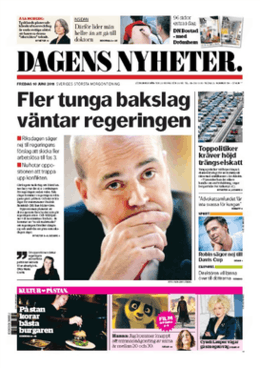 ↑ "Dagens Nyheter". Nationalencyklopedin (in Swedish). Retrieved 25 March 2011. Wikimedia Commons has media related to Dagens Nyheter.